TheRustedChain - The Blog: Don't look at this. If you're a member of my family, look away now. No really! Click on a different page! It has been cold here lately and that brings out my inner Martha. I've even been known to pop on an apron, just because it is cute. I dream of being a domestic crafty goddess. So the kids and I made our Christmas cards. You may have seen my cards before. I only make them a few times a year and I'm certainly no expert, but it's really fun! I made a template out of cardstock. Let the kids trace, cut and glue. The great thing about this is it cannot be messed up! I took these pictures at night and the lighting is poor. But the top paper (swirly pattern) and bottom paper (polka dots) are both fuzzy. Textured. Cute. On clearance at Hobby Lobby! My friend actually thought they were fabric and that would be a great idea too. Use fabric on this design. so I may have to settle for the way they are. But I wanted to share them with you, in case you were looking for a crazy easy and cute craft that is kid friendly. And on the Christmas note, I'm about halfway done sending out emails for the 2009 Blogger Ornament Exchange. I need to find about 2 more hours and send the rest. But they're coming, so don't worry! I need coffee. See ya. I love them! Especially how the kids can help - brilliant!! very cute! i think i am going to make ours this year for the first time ever. color me nervous. 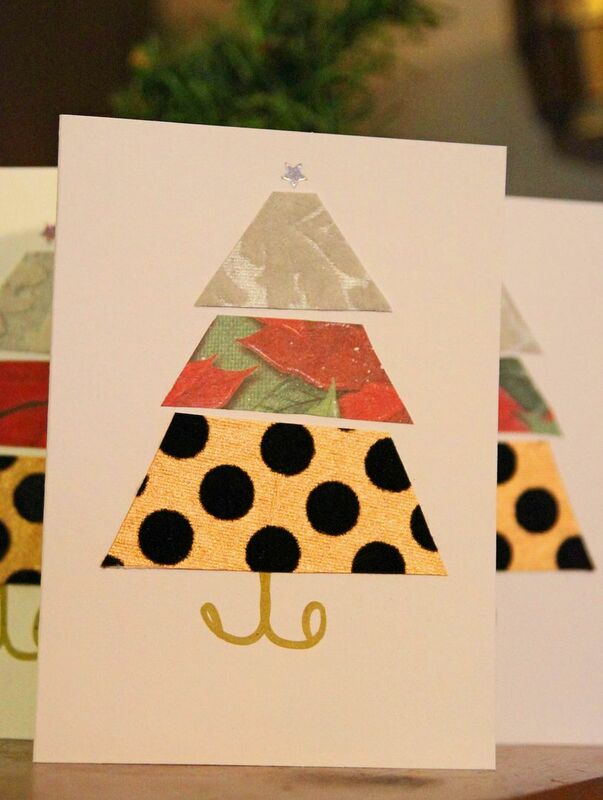 I am making my own cards this Christmas too but I am more into the stamping part of it I hope mine look as good as yours. Awesome Job!!! Super cute idea! I need to do these soon w/my girls! HOW you do it all... my goodness! i LOVE that yall all did them together... the best part. i have to admit... mine will be delivered by UPS soon... :)! I love this craft idea!! I bet my kids would have a ball making this too! 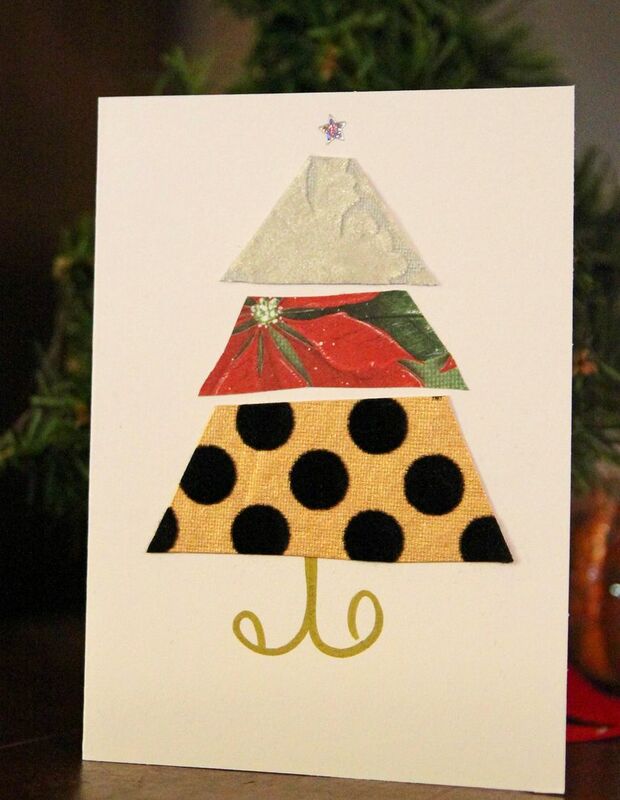 Of course, I'm not sending out cards this year, except for the grandmothers... what a fun idea. Darn. I have work to do, but now I have to make those cards. So clever! I love how the kids can help. Love the cards, very pretty! beki you are so creative! those are adorable!! Should I not have looked? Did I ruin my surprise? I mean, you do look at me as family, right? Your long-lost sister maybe? I must be related, 'cause I totally get it about your cluter. i'm so excited to see who my partner is! Thanks for all your hard work on this! Love the crafy you... great great cards!!! So cute! I may have steal your idea. Although I would have to do them all myself. A 19 month old with glue and scissors may not be a good idea! These cards are great & a wonderful way to have the kids help out. Thanks for the super cute and easy card idea...that's the best kind! What a very cute idea! I love these! So fun, and I actually just wrote about needing some ideas for kid crafts!! Thank you for reading my mind. Hee. I love, LOVE these! Going to have to borrow this great idea! Thanks you for sharing! i love them! when there's free labour to be had in the house... better bet you should make good use of those tiny hands. good work on the swap emails - must have taken you forever! LOVE them :) Super creative & cute! Fun that your kids got to help :) I think your family will love them. Love the cards, am going to try to make them. Oh, everyone who gets one is going to love it. Love them! And the fact they are kid friendly. Everyone gets to join in the fun. What a great idea! I've been running around trying get some pics of the boys for our Christmas cards but this would be A LOT less stressful and MORE fun! Oh, I LOVE this. Very cute and easy- I'm going to have the girls' classrooms do them too!